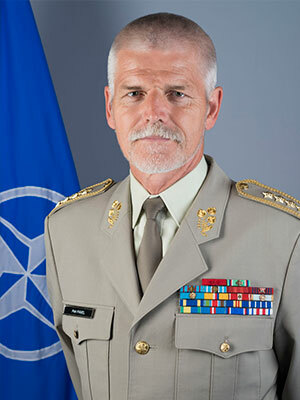 GEN Petr PAVEL, M. A.
I am happy that I can support, in my capacity of the Chairman of the NATO Military Committee, the FUTURE FORCES FORUM project. Events such as the FFF contribute to the exchange of information among experts in various fields and provide a unique opportunity to get acquainted with the latest trends in the realm of defence and security. Thanks to projects such as the FFF, we can deal with present and future threats and risks more successfully. Present developments in the area of security bring new dynamics both in the performance of defence tasks and in the development of defence concepts which require the most modern and comprehensive approaches and effective international cooperation making use of the latest knowledge. NATO is actively supporting and promoting an innovative approach dealing with present and potential future threats. Within the Alliance, the lead role in the field of innovation is performed by the Allied Command Transformation (ACT) located in Norfolk, United States. ACT analyses trends and future security risks and uses results of the analyses to define recommendations and requirements that will be placed on Allied Armed Forces in the future. At the same time, it identifies opportunities of how Armed Forces of the NATO member states could contribute to the future security environment, such as enhanced cooperation, use of new technologies, or a better understanding of the human aspects of warfare. The aim of all the activities mentioned above is to provide a long-time perspective for the Alliance, and thus support NATO's defence planning process and all related processes, ensuring the continued relevance of NATO's Armed Forces. The FFF project is particularly valuable in addressing not only military elements, but also a number of other relevant players that are indispensable for a comprehensive approach to present and future security issues. I am convinced this year´s FFF will provide a wealth of valuable information and create contacts for all participants. Leaving the FFF this year, we will be able to have a better understanding of the dynamically developing security environment and be better prepared to ensure our defence and security.